Construction of transmission line rights-of-way (ROW) across or alongside streams and rivers may result in temporary ecological impacts during construction as well as permanent habitat degradation. Constructing and maintaining transmission lines can also affect streams near the ROW both directly and indirectly. The primary direct effects are caused by construction or maintenance vehicles crossing or working within stream beds, floodplains, or bank areas, which may release sediment, construction debris, and contaminants into the stream. Vulnerable aquatic or riparian zone species may also be disturbed by noise, dust, and construction-caused changes in drainage patterns or soil. Tree removal during construction can result in immediate as well as long-term soil erosion that increases sediment loads in streams. Large rivers may be too wide to avoid placing towers directly adjacent to the water, or within the river itself. For example, the 500 kV line crossing the lower Potomac River near Moss Point, shown in Figure 4-20, includes six towers in the river and a parallel set of towers has been proposed to support a second circuit. All of Maryland’s major rivers, both tidal and nontidal, are crossed by transmission lines. At present, only one of these crossings — SMECO’s transmission line between St. Mary’s County and Calvert County near the mouth of the Patuxent River — is accomplished by a cable beneath the river. Potential impacts from transmission support structures placed in the riverbed include disturbance to fish and bottom dwelling organism habitat, redirection of water currents and erosion patterns, and potential hazards to navigation and commercial fishing. Above the waterline, the towers may provide nesting and roosting opportunities for some birds, while other birds may collide with the towers or the wires between them. Special care must also be taken to protect and enhance first order streams. Any effects that propagate downstream, such as warmer water temperatures or increased sediment load, will also be detrimental downstream. In lower reaches of the watershed, the synergistic effects could cause a shift in water quality, initiate changes in aquatic species composition, or modify the configuration of the drainage channel. For this reason, protection of headwater streams – including small swales, creeks, vernal pools, wetlands, etc., that are the origins of most rivers – has been emphasized by State agencies. To minimize effects to streams, the State agencies typically recommend that towers be located as far from stream banks and their buffers as possible, and require vegetation and construction management practices that minimize the movement of disturbed soil and construction debris toward streams. Construction and maintenance of transmission lines and their associated ROWs are known to affect freshwater streams through loss of vegetation and shading, bank erosion and sedimentation during construction, and herbicide contamination during maintenance activities. Long-term effects of increased water temperature due to clearing and runoff from maintenance treatments also elicit concern. These effects can be minimized with good practices. In areas where streams are already degraded, effective maintenance practices can assist restoration, particularly with landowner and community participation. Removing trees in or adjacent to a transmission line ROW may be necessary to maintain adequate clearance between taller vegetation and transmission line conductors. It also allows equipment to access the ROW during construction and maintenance. Such clearing can affect streams in a variety of ways, but soil erosion is the most damaging. The root systems of trees are important for preventing erosion and slumping of the banks of rivers and streams. Soil erosion resulting from removing trees often produces increased sediment loads in streams, leading to changes in stream morphology and diminished water quality, which ultimately degrade the biological resources of the stream. Removing vegetation from the riparian area reduces stream shading and decreases the amount of leaf litter, woody debris, and rootwads present in the stream system. This may result in increasing water temperatures and a reduction in habitat and food sources that threaten survival and reproduction of cold water species, including brook trout. No strong effect of a single transmission line ROW on average stream temperature has been documented, but protection of coolwater or coldwater habitat is advisable as a cautionary measure. In most cases, long-term effects can be minimized by placing transmission line towers sufficiently far from the stream that the wires span the stream and associated riparian area. This configuration is particularly effective at reducing impacts when natural vegetation is maintained in the riparian area. However, many ROWs that have been managed in traditional ways or that have towers or poles on the stream banks are entirely cleared to the edges of the stream. Even following best practices, the construction and maintenance of transmission lines and their ROWs can inadvertently introduce contaminants into a stream ecosystem. Any spills that occur during the construction phase of the project (e.g., gasoline or oil from construction equipment) must be contained immediately and removed to the maximum extent possible. In order to manage the vegetation in the ROW after the construction phase is completed, pesticides and herbicides may be applied to the vegetation in the vicinity. Excessive application, wind-blown spray, and uncontrolled runoff of these chemicals may deposit them in streams and degrade water quality and, ultimately, damage the biological resources that are present. The PSC requires that EPA-approved substances that degrade quickly and that have minimal side effects be used for vegetation management. The State of Maryland recognizes some streams and rivers as having particular natural values that deserve additional regulatory protection. These high quality waters include Scenic Rivers and Tier II streams, both of which may be affected by transmission line ROWs. 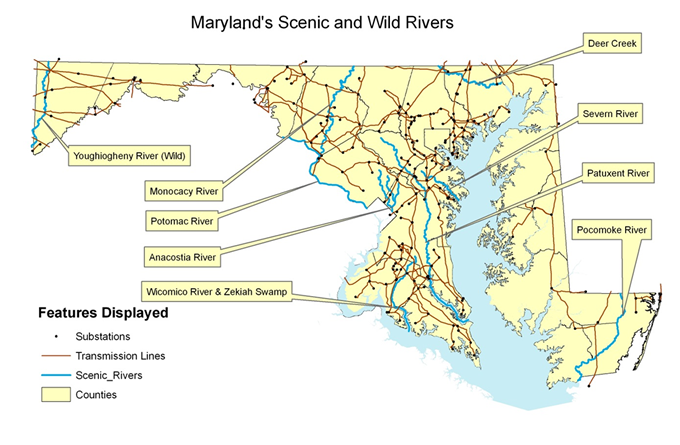 A map of the Scenic and Wild Rivers and transmission lines corridors in Maryland is illustrated in Figure 4-21. Reviews of the potential impacts of proposed transmission lines are conducted to ensure that impacts on these resources are avoided or minimized. A Scenic River is defined as a “free-flowing river whose shoreline and related land are predominantly forested, agricultural, grassland, marshland, or swampland with a minimum of development for at least 2 miles of the river length.” The Wild and Scenic Rivers Act mandates the preparation of river resource management plans for any river designated scenic and/or wild by the General Assembly. These plans identify river-related resources, issues and existing conservation programs, and make recommendations on the recreational use of the river and protection of special riverine features. Each unit of State and local government, in recognizing the intent of the Act and the Scenic and Wild Rivers Program, is required to take whatever action is necessary to protect and enhance the qualities of a designated river and its tributaries. In many cases, a Scenic River will also have a Watershed Restoration Action Strategy (WRAS), which is a means of implementing the recommendations set forth in the river’s management plan. Recent transmission projects that have crossed Maryland Scenic Rivers and their watersheds include the Mt. Storm-Doubs project (which crossed the Potomac River in Frederick County), the Monocacy-Ringgold-Catoctin project (the Monocacy River), the Bagley-Graceton and Conastone-Graceton rebuilds (Deer Creek), SMECO's Southern Maryland Reliability Loop project (the Patuxent River), and DPL’s Piney Grove to Wattsville new 138 kV line (Pocomoke River). The review of these projects paid special attention to all river and stream crossings in the associated watersheds, especially concerning riparian loss and erosion leading to downstream sedimentation. Frequently, transmission structures also significantly degrade the visual environment along the river, such as the current 69 kV line crossing the Pocomoke Scenic River. A number of Maryland’s designated scenic rivers, including the Patuxent River, the Monocacy River, and portions of the Potomac River, have incurred viewshed impacts from existing transmission line crossings. Where possible, an underground crossing may eliminate or minimize such visual impacts (see Section 4.4.2 for additional details). Particularly high quality streams are protected by Maryland's antidegradation policy that protects these waters from impacts that would degrade them to meet only the minimum standards (Tier I). The policy is laid out in three regulations: COMAR 26.08.02.04, which sets out the policy itself; COMAR 26.08.02.04-1, which provides for implementation of the antidegradation policy for Tier II (high quality) waters; and COMAR 26.08.02.04-2 which describes Tier III (Outstanding National Resource Waters or ONRW), the highest quality waters. There are Tier II streams in every county (23), though they are not evenly distributed throughout the state, and there are none located in Baltimore City. No Tier III waters have been defined in Maryland, to date. A stream designated as Tier II is provided enhanced protection against degradation of water quality and habitat, including limiting sediment loads. Areas upstream of Tier II segments are also considered vital to the protection of the Tier II segment. All development that affects Tier II waters, including transmission line construction, is subject to review by MDE to eliminate any potential degradation resulting from the proposed activities. Recent transmission line projects that cross or are located in the vicinity of Tier II waters include the BGE Bagley-Graceton, Conastone-Graceton, and Bagley-Raphael Road rebuilds (several tributaries to Deer Creek and Little Gunpowder Falls); the BGE Northwest to Deer Park project (several tributaries to Liberty Reservoir); and the Delmarva Power Church to Townsend and Church to Wye Mills rebuilds (tributaries to the Chester River), and the Piney Grove to Wattsville upgrade (Nassawango Creek). In addition to the protection of water quality and habitat by stringent best management practices (BMPs) for sediment and erosion control, PPRP has recommended specific Integrated Vegetation Management (IVM) plans in areas upstream of Tier II waters in these cases. Relocating poles that are in sensitive areas such as wetlands or riparian buffers are also recommended if necessary. The prospect of offshore wind turbines and the need for more power on Maryland's Eastern Shore have resulted in past proposals for transmission across (under) large expanses of the Chesapeake Bay or the waters off of Maryland's Atlantic Coast. Recent technological advances have significantly improved the feasibility and cost effectiveness of long-distance submarine cable installations that would be required for such projects. Underwater cables have already been built in several areas of the United States, including Long Island Sound, Raritan Bay, and San Francisco Bay. Submarine cables offer visual and engineering advantages compared to overhead lines across water bodies. In any specific area, these advantages have to be compared with the impacts to the biological communities that inhabit the bottom, and the food chains that depend on them. A submarine transmission line would be expected to have multiple short-term, acute impacts caused by installation activities, and long-term impacts from construction disturbance, maintenance activities, and the operation of the electric power line once it is energized. Underwater transmission cables usually are placed several feet deep in the bottom sediments. Under some circumstances, such as rocky hard bottom, the cable is just placed directly on the bottom. This latter technique affords the least protection from currents and man-made disturbance, such as being hooked by an anchor or damaged by commercial fishing operations. Installation of the cables can be accomplished by several methods, including horizontal directional drilling (HDD), the use of a jet plow, trench excavation, or a combination of these techniques. The HDD technique uses pressurized drilling muds, which may be released accidentally through weaknesses in the overburden, thereby contaminating sediments and increasing turbidity in the surrounding area. Jet plowing involves several steps to clear the area of debris prior to cable installation (e.g., grapnel dredging, pre-jet plowing), resulting in multiple sediment disturbances and the direct loss of benthic habitat along the cable corridor before the cable is even placed in the trench. 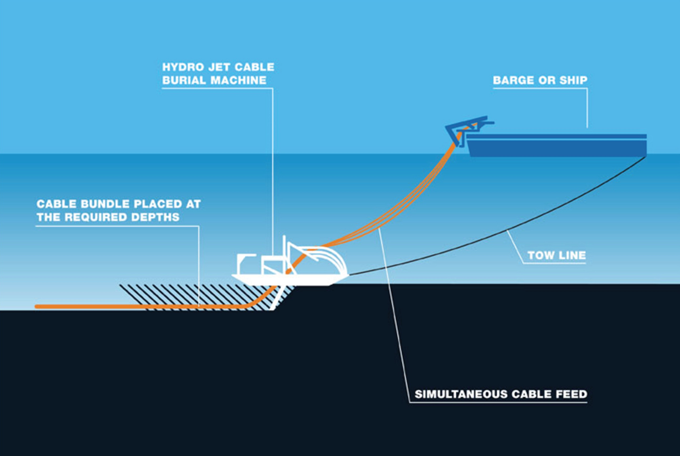 During installation, which is depicted in Figure 4-22, a large jet plow sled is pulled along the cable corridor with high-pressure water jets fluidizing the sediment into which the cable sinks. Direct trench excavation creates the most impact due to removal and replacement of excavated materials. 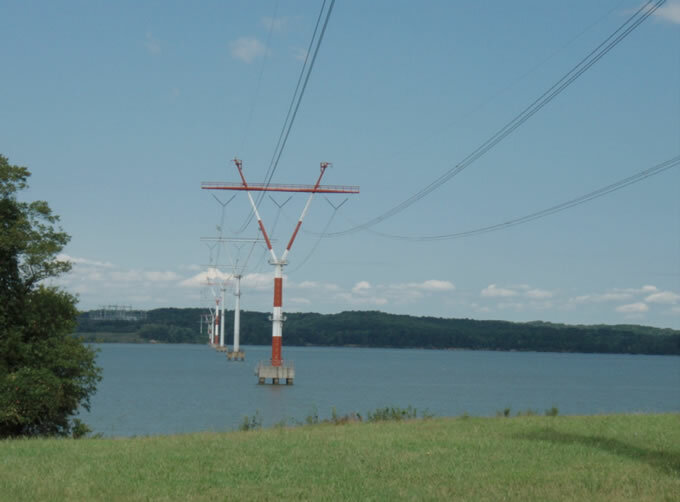 SMECO’s Holland Cliff to Hewitt Road 230 kV Transmission Line Project included a crossing at the Patuxent River that was drilled under the riverbed using HDD. The crossing is parallel to and upriver from the Rt. 4 Bridge between Johnstown and Town Creek, Maryland, with end points at Point Patience and Patuxent Beach Road. A portion of the line also traverses the Navy Recreation Center (NRC) in Solomons through underground duct banks (concrete‐lined trenches used to place power cables underground, then covered with vegetation or pavement). Although the termination point is within the Chesapeake Bay Critical Area, a previously developed site was selected. The underground cable crossing is in an area of the river that is rich in biological resources including oysters, habitat for overwintering ducks, tidal wetlands, and submerged aquatic vegetation. SMECO completed the environmental studies required to comply with conditions of the CPCN concerning HDD beneath the Patuxent River. A sampling plan was required to establish the river bottom baseline conditions using geotechnical and biological surveys of the river bottom and included provisions for additional sampling if an inadvertent release of drilling fluids (“frac‐out”) was suspected or confirmed during the HDD process. Pollution history and sampling data obtained by SMECO were used in formulating a Contingency Plan to help protect the living resources of the Patuxent River in the event of a frac-out. The HDD under the Patuxent River was successfully completed without incident in October and November of 2013. In Maryland, the laws that protect the "Critical Area" around the Chesapeake Bay and the Atlantic Coastal Bays require thorough environmental evaluations before building these types of underwater transmission lines. The Critical Area includes, in addition to the waters of the Chesapeake Bay and the Atlantic Coastal Bays and the submerged land below them, all land within 1,000 feet of either the mean high water line of tidal waters or the landward edge of tidal wetlands. The Critical Area Act (1984) authorizes State and local governments to assess impacts caused by construction disturbances, run-off, and activities within the 1,000-foot buffer zone. Any projects which may directly or indirectly affect the Critical Area in the state, including transmission line ROWs, are required to seek and obtain approval from the Critical Area Commission. During project review, impacts evaluated include effects on turbidity, alterations of nutrient and dissolved oxygen concentrations, thermal changes, electromagnetic fields produced by the cables, salinity, and the creation of physical barriers on or in the bottom sediments. Continuously operated buried cables typically reach internal core temperatures of 90°C and may create zones of elevated sediment temperature above ambient conditions, depending on sediment thermal characteristics. Heat released during the operation of the cable could create a permanently warm area, affecting benthic habitats, spawning times of sessile species, and water mixing patterns. Long-term heating of the sediment could also create refuges for or increase the rate of growth of bacteria such as Vibrio vulnificus and E. coli. Oysters and other shellfish that ingest these bacteria pose a human health risk. Aquatic habitats may be affected by re-suspension of sediments during construction or maintenance of the cables that may release contaminants or nutrients into the water column. Depending on the depth profile and tidal influences, disturbances that re-suspend sediments or contaminants could have effects well beyond the immediate physical footprint of the cable path, such as nearby oyster and clam beds. An underwater cable could therefore affect the benthic habitat and the species that depend upon it for food, spawning, or juvenile development - including oysters, softshell clams, crabs, resident and migratory fish, overwintering sea ducks, and many other sensitive species. In light of these potential impacts, PPRP has conducted research studies along Maryland's Atlantic Coast to identify benthic and aquatic resources that would be at risk from transmission cables originating at offshore wind farms. Transmission line structures have a small potential to affect ground water resources, particularly in areas where the water table is close to the surface. Potential impacts to ground water would occur mainly during the construction or installation of the structures, whether above ground or underground. The construction of new overhead transmission tower foundations or underground cable facilities may require drilling to depths that can penetrate shallow water tables or open access channels to deeper aquifers. For example, typical estimated drilling depths required for new structures for 230 kV transmission line projects (such as the recent SMECO Holland Cliffs to Hewitt Road or the Potomac Edison Monocacy-Ringgold-Catoctin projects) are approximately 40 feet below ground surface. In many areas of the state, potable water supplies are much deeper than this and would not be at risk. However, the depth to ground water is much less in areas such as the Eastern Shore where many upgrade projects are being conducted. As structure heights increase for higher voltage overhead transmission lines, the required drilling depths become deeper; therefore, the tower foundation and cable conduit drilling depths need to be compared carefully to the depth to ground water for many proposed transmission line projects in Maryland. Alternatives to traditional overhead construction, such as underground and submarine cable installations, are becoming increasingly more common as the technology advances. Potential impacts associated with underground installations may include the redirection of ground water flow associated with the construction of underground duct banks and splice boxes or backfilling the trenches with material of differing porosity. Another potential effect could be an increase in ground water temperature due to the heating of an underground cable during its operation. The existence and magnitude of these impacts will be dependent upon several site-specific factors, including the project location, installation depth, construction technique employed, soil type, and depth to ground water. Streams and water bodies found within Maryland provide habitat for a diverse assemblage of invertebrate and vertebrate species, ranging from coldwater to warmwater species, and from species that require high-quality habitat to those that are tolerant of impaired water quality conditions. As mentioned in previous sections, construction and maintenance of transmission lines and their associated ROWs affect freshwater streams through the loss of vegetation and shading, bank erosion and sedimentation during construction and herbicide contamination during maintenance activities. Many aquatic wildlife species may suffer, especially if Best Maintenance Practices are not followed. For example, the brook trout (Salvelinus fontinalis) is an aquatic species that was historically prevalent in Maryland waters. Decreases in water quality and habitat degradation have placed this species in decline in Maryland. The brook trout is a coldwater species, dependent on streams with maximum water temperatures of 22℃. Removal of riparian vegetation at a brook trout stream, such as what would occur during the maintenance of a transmission line ROW, would decrease stream shading, thereby increasing the water temperature. This increase in the temperature could drive the brook trout out of a stream, leaving a habitat niche available for a non-native species such as the brown trout (Salmo trutta) to compete for resources. Threatened and endangered species are subject to the same impacts from the construction and maintenance of transmission line ROWs as other wildlife, but must be protected to the maximum extent possible. Aside from avoiding the area containing the habitat of the threatened or endangered species, time of year restrictions may be applied to activities within the ROW to avoid times when the species is breeding or especially active. For example, the proposed rebuilding of Delmarva's Church to Steele transmission line would occur upstream of existing known populations of the state-listed endangered dwarf wedge mussel (Alismidonta heterodon). The dwarf wedge mussel is an extremely rare freshwater species found only in Maryland, New England, and North Carolina. It has very specific habitat requirements, including a stable, silt-free stream bed and well-oxygenated water free of pollutants. The mussel serves as an indicator species, as it is extremely intolerant to water quality pollution. The presence of this mussel in streams is indicative of extremely high water quality. The challenge to the project will be to protect the water quality through strict sediment and erosion control BMPs upstream of any known populations. Because the health of an ecosystem depends on functional interactions between its components, impacts to multiple resources can have a cumulative effect much greater than a simple tally of the individual impacts would suggest. It is important to assess and address such multiple impacts. In addition to specific areas of multiple impacts, many small impacts to a single resource along a ROW can add up to a significant overall impact to that resource. It is also necessary to minimize such effects if they occur. Cumulative effects can be assessed in several ways. The effect of multiple stresses on an ecosystem is usually measured against a standard for permissible impacts or a goal for restoration. For example, Maryland’s Wild and Scenic Rivers Act applies to the natural resources of State-designated Scenic Rivers and their tributaries (see Section 4.2.2 – Impacts to High Quality Waters), thus limiting any combination of activities within the watershed that would degrade the condition and quality of the designated river. Individual resources, on the other hand, are handled in terms of specific impact thresholds or goals. Transmission lines that cross numerous streams and rivers within a single watershed may degrade the overall biological health of that watershed. Any local effects that propagate downstream, such as warmer water temperatures or increased sediment load, will accumulate in lower reaches of the watershed. The summed effects could cause a shift in water quality, initiate changes in aquatic species composition, or modify the configuration of the drainage channel. Evaluating the potential for such effects is always included in the reviews of proposed transmission line projects.